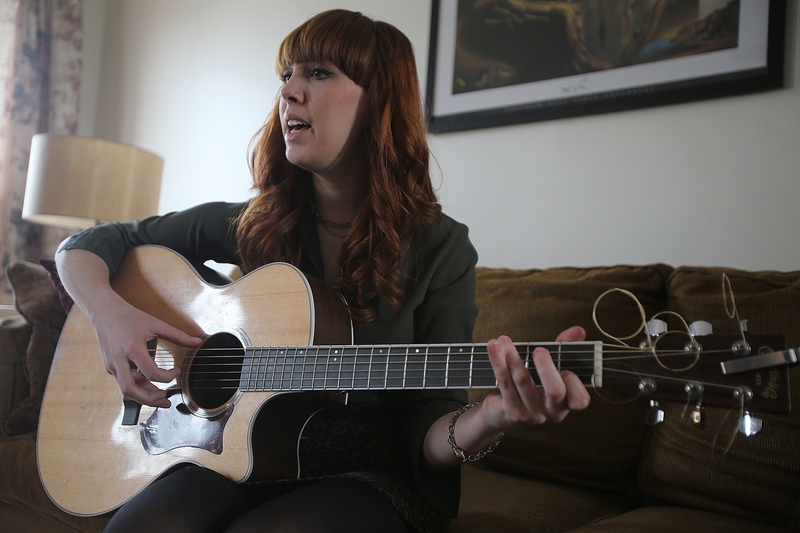 Savannah King, 20, plays guitar and sings one of her original songs at her home in Wilson earlier this month. The Fredonia State College junior is working on her third album and preparing to tour. WILSON – Wilson native Savannah King is just 20, but she is coming into her own. With a smoky, folksy sound reminiscent of Joni Mitchell, Ani DiFranco and Sarah McLachlan, she also displays the hard-won music business acumen of a long-time circuit traveler. King, a 2011 graduate of Wilson High School, has been very innovative while studying music industry at Fredonia State College, where she is a junior. The acoustic guitar-playing singer and songwriter creates internships for fellow college students by taking them on the road with her for short tours and relying on them to create and maintain her very inviting website. King also has created the “Alphabet Project” on her website, where she introduces a new video at 1 p.m. every Sunday, featuring song choices from A to Z. And she participated in a “concert window” earlier this month, with a live webcast on which she performed songs from her new album, took requests and answered questions in real time. Eager to get back on the road, King also has a number of local appearances slated in coming weeks in Erie and Niagara counties. Catching up with this charming redheaded whirlwind is a challenge, but well worth it. It’s trite, but where did it all begin? When I was about 5, I started playing piano and taking lessons. Then I moved to violin in middle school and then when I was 13 or 14, I started playing guitar and I begged my parents for lessons. I’d come home from school and sit down and play guitar until I went to bed at night, so they could see how dedicated I was and let me take lessons. Then I begged for voice lessons. My mom was a singer – she did musical theater – and my dad was a musician all his life, so they got me voice lessons. I studied with Amy Teal in Lewiston. She’s fantastic and even though I don’t sing opera, she trained me for opera and it’s the basis for everything I do – all of the technique and everything I need to sing without destroying my natural style. Were you always comfortable as a performer? I was not comfortable at all on stage. I was happier in my bedroom playing guitar and singing. But slowly, I started playing for a friend and then for my parents, and then eventually I’d play for anyone who would listen to me. I was in school plays and the chorus. I overcame that stage fright and now I love it. You’ve been very supportive of Music is Art, the charity of Robbie Takac of the Goo Goo Dolls. Why? I really wanted to help kids coming up in the music business, or even just kids who want to pick up a clarinet or a guitar, and make this available to everyone. This is tough these days, with all of the school budget cuts. But one of the things Music is Art does is hold instrument drives, and that helps youth so much. So I decided I wanted to help because this is very personal to me. So all proceeds from my second album, “She Sends Her Love” go to Music is Art. And speaking of charity, earlier this month you released a song to benefit Melina’s White Light, a charity fighting the childhood cancer neuroblastoma. What is the story behind that? I wrote and performed that song with Grace Stumberg and Tina Williams, who are both Buffalo artists. Armand Petri recorded and produced it – he’s head of the music industry department at Fredonia. We did it through HAIL Fredonia, a student-run label for charity. It’s really awesome to be in class, be on a label and benefit a charity. You’ve also been very busy working on a third album. What will that be like? I’m working with a whole other group of musicians on that and we’re doing lots of exciting things. I’m not saying it will be intentionally more bluesy or more jazzy, I’m just letting what I write and what the others bring to the equation decide what the sound is. It’ll still be folksy and rootsy, but it’ll sound a little different. It’ll be independently released, probably late spring or early summer. I’ll be going out again on tour at the end of May and again in June. We’ll go to Philly, New York City and Boston. When I was a senior in high school, I played in San Diego and Nashville. I did my first tour last May. I planned it all myself – I Googled venues, emailed them and they called me back and I did it. I’d get a place to stay and I’d take a few friends and we’d go for two weeks on the road. We played Ohio, West Virginia, Virginia, Philly and New York and Pittsburgh. We’ve done a couple of more of them since then and it’s so much fun. I’ve started using interns – they need the college credit and I need the help. It’s really been a learning experience for everyone. My friend Mark Bamann [from Fredonia State] went with me last time; he’s fantastic on electric guitar. And I have two computer science friends who needed an internship and they built and maintain my website. You’ve got to have a website, but I don’t have thousands of dollars for it and they need the experience for their resumé. Where do you draw your song ideas? My biggest inspiration is people. I’m only 20, so I don’t have a ton of life experience and I’ve only started writing about myself recently. But I love to write other people’s stories. It’s awesome – the people I’ve gotten to meet. I love it and there’s so much to tell. Your junior year is winding down and senior year is on the horizon. What are your future plans? I’m along for the ride. I do try and plan things out, but I have to leave things open for fate to take over. … They say, “If you love what you do, you’ll never work a day in your life.” It’s corny, but it’s true. King will perform at Thursday at Nietzsche’s, 248 Allen St., Buffalo; Friday at the Sportsmen’s Tavern, 326 Amherst St., Buffalo; April 11 at the Evening Star, 8810 Niagara Falls Blvd., Niagara Falls; April 25 at PeopleArt at Unity Church, 1243 Delaware Ave., Buffalo; and July 9 with Davey O at the Newfane Summer Concert series at the Main Street Gazebo.